After a long career in the aerospace industry, Joe Muldoon took early retirement and embarked on a new adventure with his wife Verna, traveling the country with their trusty fifth-wheel. After several years of exploring, the couple decided to trade their trailer for a home in Sun City West. They considered other appealing communities, but a certain amenity won them over: accessible health care. “When you get older that’s extremely important…where are you going to go if there’s a problem?” Joe says. The couple was especially impressed by residents’ support of the local hospitals through volunteering as well as financial donations to Sun Health Foundation. Joe and Verna decided to commit as well, becoming legacy estate donors. A portion of the couple’s estate is earmarked for Sun Health Foundation to support the wide range of health and education programs and services. Estate gifts are vital for the future of the foundation, says Pamela Gralton Kohnen, the Foundation’s senior development director. The Muldoons are opting to give their entire estate to various charitable organizations and have signed a letter of intent to support Sun Health Foundation. “That can be modified or changed if needed, but it helps the foundation plan for the future,” Pamela says. The Muldoons moved to Sun City West in 1999. Married for 44 years — a second marriage for both — the couple has six children between them. 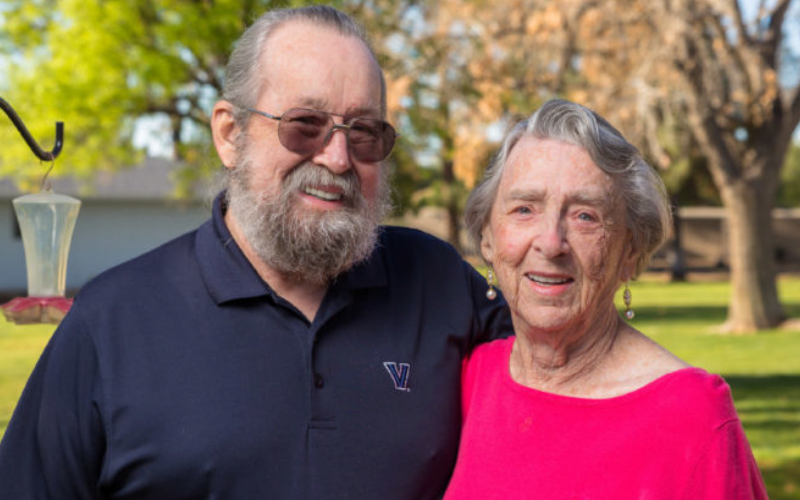 Before retiring, Joe and Verna both enjoyed successful careers. Joe, an electrical engineer, spent more than 30 years with Boeing in Philadelphia and Seattle. During his time there, he worked as a key integrator on the Minuteman Intercontinental Ballistic Missile system, the nation’s land-based nuclear deterrent and a longtime project for Boeing. Verna worked in the employment industry and later as a Realtor. After Joe’s retirement in 1995, the couple’s travels in their fifth-wheel took them across the Southwest. They ultimately decided to call Arizona home. The Muldoons have been active in a range of community activities, from golf and softball to jewelry-making and painting. Travel continues to be a passion for the couple. They have enjoyed 15 cruises to various destinations around the world, with the latest trip taking them to the Panama Canal. Joe, who paints watercolors, has captured many of those vacation scenes in paintings that hang in the couple’s home. Looking back on their decision to put down roots in Arizona, Joe and Verna are grateful for the full life they have been leading in Sun City West. Supporting local health care through their estate made perfect sense.